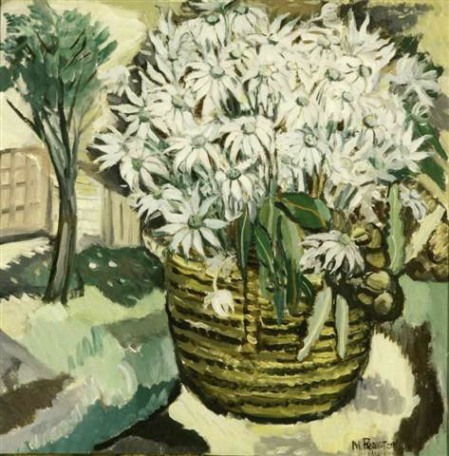 Margaret Preston was born Margaret Rose McPherson in Port Adelaide, 1875. She studied at the National Gallery School, Melbourne in 1893 and at the Adelaide School of Design, Painting and Technical Arts in 1898. In 1912 she took pottery class in London and in 1938 again studied in London at a decoration school. Throughout her life she travelled extensively first going to Europe in 1904 and then throughout Australia, the Middle East, Africa, Europe and the Pacific Islands. Accordingly, her are reflects the influences of these cultural experiences. There are elements of Japanese and Chinese principles of design, primitivism, and foremostly, European modernism, which she explored during her travels and instruction in Paris, Munich and London, liberally incorporated in her work. During the interwar period Preston was increasingly influenced by Australian indigenous art, believing that it was only through Aboriginal visual culture that we would be able to create a truly national artistic identity. It is noteworthy that Preston was essentially the first artist to recognise the importance of the Australian Indigenous aesthetic, employing flattened planes, strong forms and eliminating highlights in her works. She adopted Aboriginal motifs and mixed these with more Western style imagery, often presenting aerial views as well as side views of an animal set in a slightly flattened landscape. These works use a more restrictive palette. She brought this economical, graphic analysis of form into the domestic sphere, validating the domestic sphere through modernist execution. Preston was to played a significant role in the formulation of Australian modernism, working not only as a painter, and wood and lino cut printer, but also as an influential teacher of both practical and theoretical art. She was an acclaimed figure within the Sydney art scene from the 1920s onwards, and significantly, only she and Thea Proctor were the only women to be featured in Sydney Ure Smith's Art in Australia magazine, during the first half of the twentieth century.